Valentine’s Day Celebrations Are A Tradition At Havana Club And Grill. Dine In A Romantic Atmosphere Or Just Stop By To Enjoy Your Favorite Drink. No Cover! Doors Open At 8 PM. Restaurant Open Until Midnight. Live Music By Midnight Band Until 2 AM. For Reservations Or Further Info Please Call 956-687-3100. Our last New Year’s Parties were a success (as shown in above picture) and we expect the same for our New Year’s Party 2018-2019! Book Your Christmas Party At Havana Club And Grill! Christmas Parties are a tradition at Havana Club and Grill. Our restaurant and bars will be open during the 2018 Holiday Season. We will help you select your menu from our regular dishes or prepare a customized one for your group. The club already has Christmas decorations in place and there is Live Music nightly. You can choose your party location to be in our general areas or in our Private VIP Room. We have ample lighted parking onsite . You can visit other sections of our website for further information about the club or call us at 956-687-3100 if you need any further information. Awesome Halloween Party On Wednesday 10-31-18! 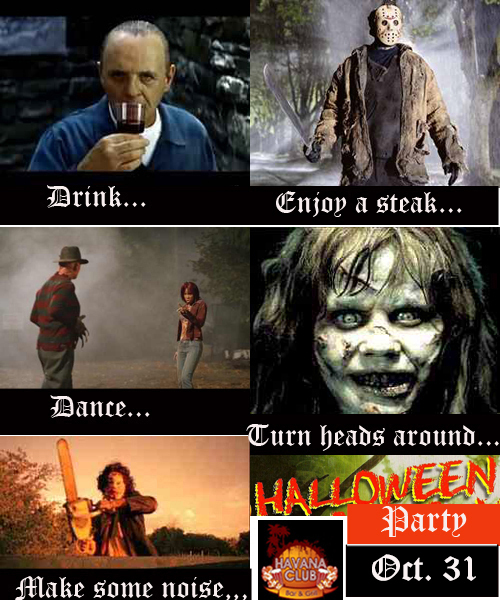 AWESOME HALLOWEEN PARTY ON WEDNESDAY OCTOBER 31st!! Costume Optional- Dance Classes At 8:30 And 9:30 PM – Restaurant Open Until 11 PM – Continue The Party With Midnight Band Until 2 AM!! 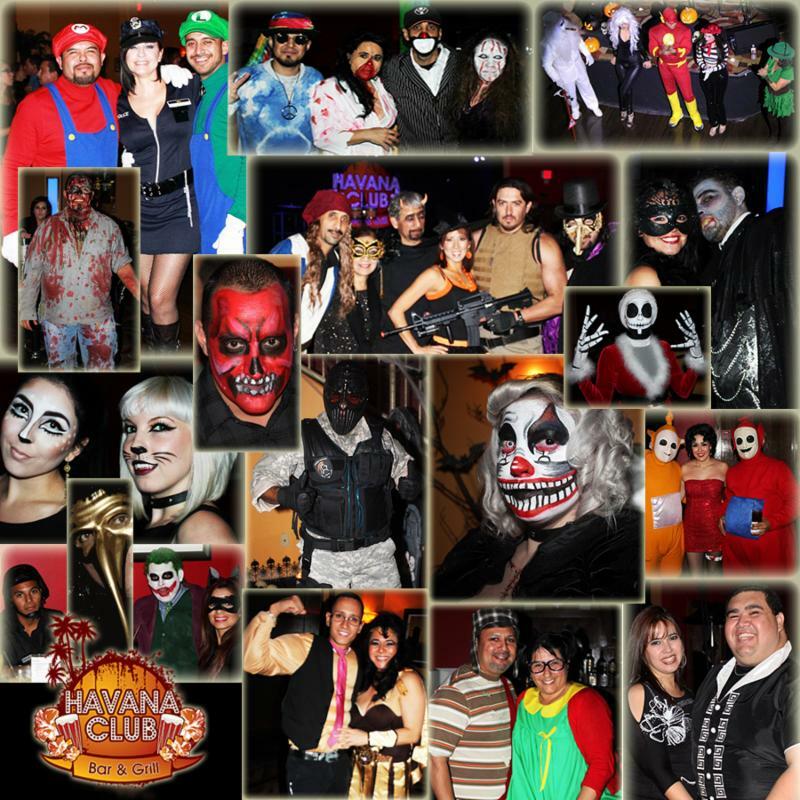 Join Us For A Great Halloween Party On Wednesday, October 31st, 2018. As On Any Other Wednesday, There Will Be Salsa/Bachata Classes at 8:30 And 9:30 PM. Our Restaurant Will Be Open until 11 PM. It Is Likely That Many People Will Wear Costumes. However, a Costume Is Optional. Midnight Band Will Continue The Party Until 2 AM!! If You Need Any Further Information, Please Call 956-687-3100. Mariachi 7 Leguas Concert On 9-13-18! The Premiere Mariachi Group From The Valley, Mariachi 7 Leguas, Will Be Back To Havana Club And Grill To Perform In Concert On Thursday, September 13th, 2018. Restaurant And Bar Open At 7 PM. The Show Is Scheduled From 8 PM to 10 PM. The Cover Is $10/Person And Includes A Seat On A Table. For Reservations Or Further Info, Please Call 956-687-3100. Christmas Parties are a tradition at Havana Club and Grill. Our restaurant and bars will be open during the 2017 Holiday Season. We will help you select your menu from our regular dishes or prepare a customized one for your group. The club already has Christmas decorations in place and there is Live Music nightly. You can choose your party location to be in our general areas or in our Private VIP Room. We have ample lighted parking onsite . You can visit other sections of our website for further information about the club or call us at 956-687-3100 if you need any further information.